ARGAKHANCHI, June 28: Sandhikharka bazaar is just a kilometer away from the Aulba River which flows along the Gorusinghe-Sandhikharka road section. The locals of Sandhikharka have been using this the banks of this river as a dumping site for years. Every day, people collect their waste and dump it on the riverbanks. So, those visiting Sandhikharka are welcomed by a huge pile of garbage. The place which should have been developed into a garden is being used as a dumping site instead. Not only the pedestrians but also the passengers travelling in vehicles on the road have to bear the bad odor coming from the dumped garbage. Discussions have been held time and again to shift the dumping site elsewhere, but in vain. 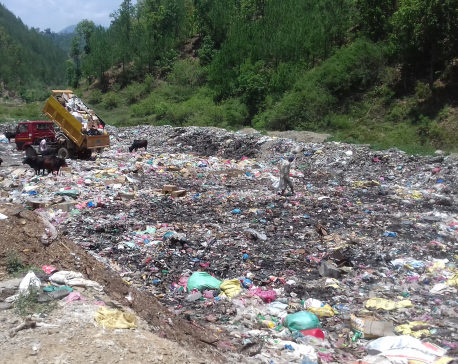 According to Kamal Prasad Bhusal, chief of Sandhikharka Municipality, various places were chosen for the dumping site but they could not be finalized due to the protest by locals. 'The locals protest every time we decide to shift the dumping site. That has been crating problems," said Bhusal, adding, "We know it's a serious problem and we are really concerned about resolving it." The waste collected from houses in Sandhikharka is dropped at the dumping site by a tipper and a tractor of the municipality. Both degradable and non-degradable wastes are dumped together. The toxic smoke released after burning the garbage makes it suffocating for the locals to breathe. This has adversely affected the health of the locals. 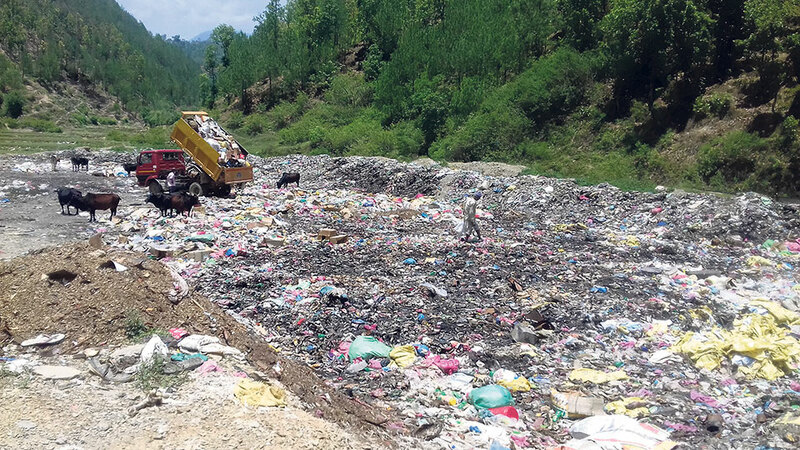 Besides that, cattle feeding on this garbage also fall ill.
Prem Narayan Gaire, executive director of Prakash Sachetan Samuha~I, an organization working for cleanliness, says the dumping site should rather be transformed into a landfill site. 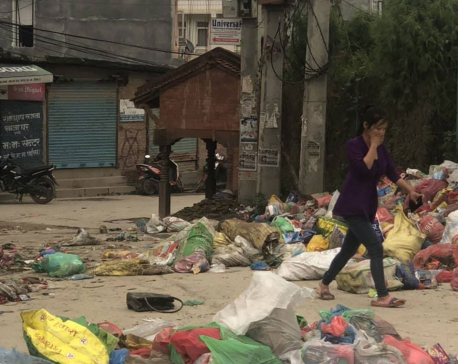 "After the formation of the landfill site, degradable and non-degradable wastes can be separated," said Gaire, adding, "We can use the garbage to produce bio-energy and generate some income." Despite being aware about the environment pollution and miseries of the locals, the authorities concerned have turned a blind eye to this. Waste management is so poor in Sandhikharka that garbage is seen everywhere on the streets, bus station, gardens, rivers and other public places.